Tracer Bullet Development was first described in the seminal text, The Pragmatic Programmer: From Journeyman to Master and expanded on in Ship It!. The idea of Tracer Bullet Development, or TBD, is to have the very first version of the software go all the way from end to end. It doesn’t have to do anything more than a “Hello, World” level program, but it needs to have all the pieces working together, from front end to back end. With this skeleton in place, everyone proceeds to a rhythm, iteratively, in time boxes to incrementally add functionality to the growing system. 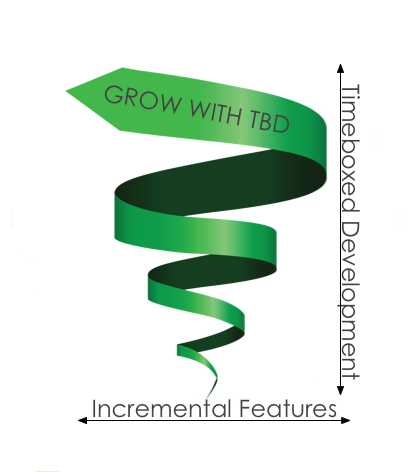 This style of development dramatically reduces risk and helps keep feedback loops short. For more detailed information, see the Tracer Bullet Development practice for Individuals. It’s not just the software, though. People, teams, and organizations must grow as well, in order to thrive (or even just survive). GROWS creates an environment of exploration and growth not only to solve technical challenges and questions, not only to produce robust and responsive software, but to grow the skills of the participants and the organization as well.